separately because of security reasons. 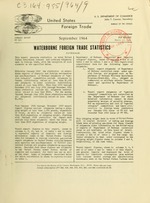 Calendar Year 1960 issue of FT 985.
cargo is not available at this level of detail. respectively, of the same table. hired for the carriage ofgoodson special voyages. ~.1 I i.; i ~." Total and transit category" Total and transit oategary"
Loa Angeles, Califr................... .53,1 256 3 255.9 245.7 10.2 0.4 273.8 273.8 273.8 22.2 21.4 0.8 3.6 3. Sea footnote at and of table. 'ess "h 50,0X) po :nds; less than 50,000 dollars. totals to obtain total exports through the Customs District of Florida. September 1963...... 39,104.6 18,896.7 1',? '.7 63.0 20,207.9 17,954.6 2,253.3 932.3 919.5 12.8 .. 1295 22.? August 19641........ 47,055.2 22,848.7 22,795.4 53.3 24,206.5 21,265.7 2,940.8 954.2 941.1 13.1 155. September 1964...... 41,383.6 21,232.1 21,166.6 65.5 20,151.5 18,757.7 1,393.8 ,017.5 1,000.0 17.5 18.4 13. 1. 4aine and New Hampshire...... 1,901.8 69.5 69.5 1,832.3 438.5 1,393.8 1.2 1.2 16.4 2.7 13. Portland, Maine........... 1,569.2 15.5 15.5 1,553.7 159.9 1,393.8 0.9 0.9 14.6 0.9 13. Baltimore................. 3,217.2 2,603.1 2,602.4 0.7 614.1 614.1 48.6 48.5 0.1 3.8 3. Florida2..................... 979.1 362.3 362.1 0.2 616.8 616.8 19.7 19.6 0.1 4.3 4.? aoL.. .................... i I.I I ..
SaHune ., T.. ........ I .2 1. L redo ....................... I. 4. 1.1 -. 3 1. 1.0 0.7 l.. 1. Bronsville, Tex .......... + 1.1 i 1.7 1.0 .7 1. 1. Chicago, 11 .............. .. : 92. * 9?'. 3. 3.3 7<. .. .- 0.4. 2 LesE rnar, '0,000i pound le- triar 5-l.103 .jil.ars. South and East Africa....................... 183.1 "3.0 1 -'.1 73."' 5.5 I.
India, Persian Gulf and Red Sea............. 2,','.4 1, t 1.121.1 ? ?. ."' 1,V.t 11.1 533.3 214..
Canadian trade areas................... ,',r. i 7C.t ..0.7 a.. '. 3* (,3--. '31.3 169.6 39'. Great Lakes Canada........................... ,31.. -"'7. ",211' *, "." (52., 2.1I '. a scheduled berth operation, etc.) using the iassi 'Ir' ionr cri'erin .-f the Maritime Administratton. scheduled berth operation, etc.) using the classification criteria of the Maritime Administraticn. 'Shipping weight in thousands of pounds. Totals represent the sums of unrounded figures, hence may vary slightly from the sums of the rounded amounts. September 1963 ................ 109,061 88,984 3,373 16,703 70,252 2,737 4,229 18,732 636 1".-'"